LAST SEASON WAS ONE OF RELATIVE DISAPPOINTMENT for Newcastle United as a series of insipid performances with little defensive structure or attacking intent still resulted in the ultimate goal of Premier League safety. There were calls for owner Mike Ashley to sell the club amid accusations that there was no ambition to progress and climb the table, and that the club was content to remain in the Premier League to take advantage of the new television deal that promised immense wealth to the clubs in the Promised Land. 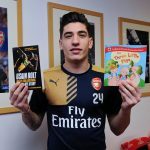 Fast-forward to the start of this season and the recriminations have in part been forgotten amidst the hope and optimism of the new season. 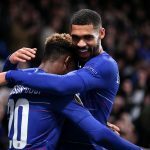 Once again recruitment at the club has been viewed in a largely positive light with chief scout Graham Carr continually making the most of his connections on the continent. This time the club targeted talent the Benelux nations, with Dutch international midfielder Georginio Wijnaldum arriving from PSV Eindhoven for a reported £14.4 million and two players moving to Tyneside from Belgian side Anderlecht in the form of Serbian forward Aleksandar Mitrović and Congolese international defender Chancel Mbemba. All three featured in the first game of the season at home to Southampton although it was the Dutchman Wijnaldum who stood out tactically with his intelligence and capacity to link the various elements of the Newcastle attack. 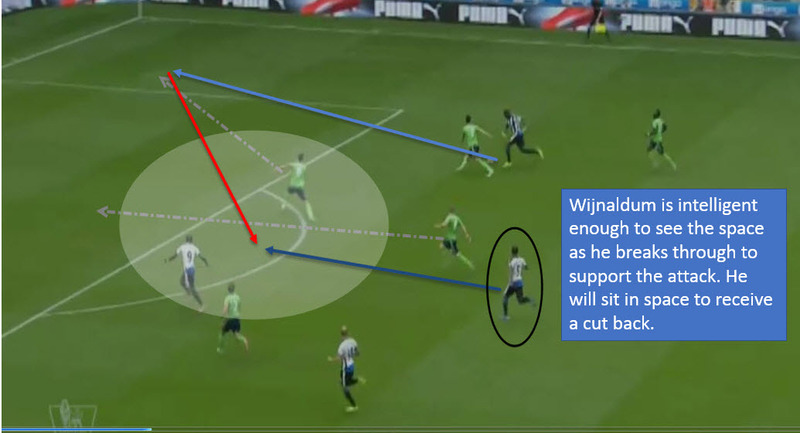 Indeed it is the tactical role that Wijnaldum played, in conjunction with the rest of the midfield, that I have chosen to concentrate on in this piece as I look at the dynamics of the double pivot at the base of midfield. Newcastle under new head coach Steve McLaren chose to line up in a reasonably orthodox 4-2-3-1 system with Jack Colback and Vurnon Anita operating in a double pivot at the base of the midfield, and Wijnaldum playing in the attacking strata along with Gabriel Obertan and Moussa Sissoko. In the early stages of the game it became clear that Wijnaldum was free to link the play between the defence, midfield and attack but that he would also be making runs beyond not only the deep central midfielders for Southampton but also beyond the defence to create overloads and marking issues. In the above image you can see the four attacking players for Newcastle engaged in an attacking movement. Sissoko is in possession of the ball on the right side and will commit the Southampton left-back as he bursts towards the byline. As soon as the left-back is beaten it forces two other Southampton players to commit towards the ball; the defender moves out to pressure the ball and the midfielder drops in to cover the space vacated by the defender. It is at this point that Wijnaldum’s footballing intelligence kicks in and he positions himself in the dead space that has been vacated by the covering runs of the two Southampton players to receive the cut back. This is actually the start of the move that led to Newcastle taking the lead and going 2-1 up at the start of the second half. As the play progresses down the right side with a lofted pass into the path of Gabriel Obertan, it is Wijnaldum who moves forward to take advantage of the space on the far side of the pitch. In the moment of transition Southampton are caught in the potential overload on the near side and have neglected the far side. Wijnaldum will continue his run into the box to connect with the cross and guide the ball towards the top left hand corner. His appreciation of space and how to use it is excellent. 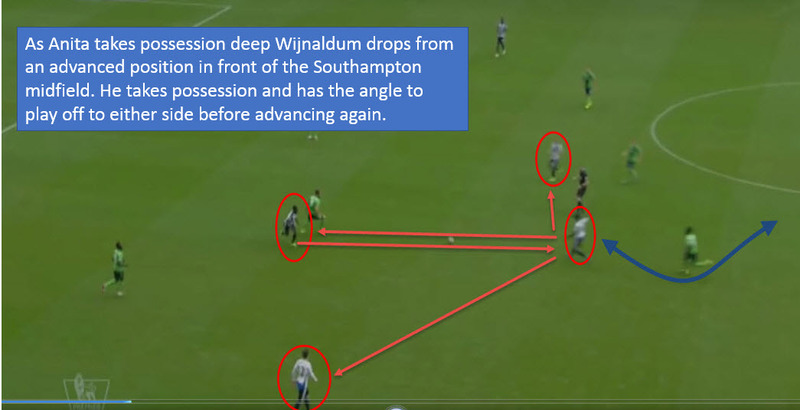 The third example that I have highlighted shows Wijnaldum moving between the lines but this time towards his own goal to offer a connection to the deeper midfielders and build possession patiently. 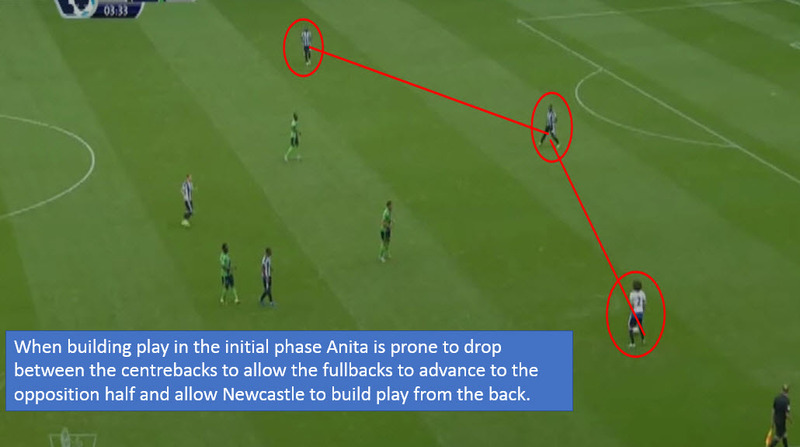 Anita has possession; the run from Wijnaldum beyond the Southampton midfielder creates a diamond of Newcastle players to enable comfortable ball retention. As Wijnaldum is given the ball he is in a position to shift the play to either side before moving forward to present another passing option. 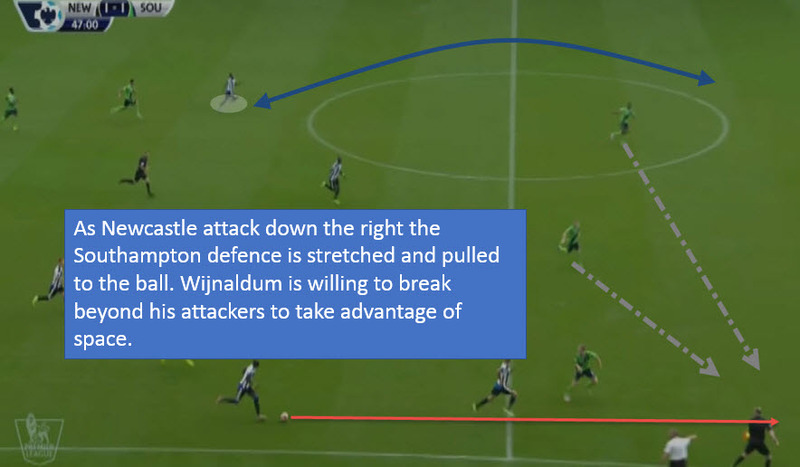 While Wijnaldum was the attacking focus playing centrally and linking play continuously throughout the game, he was allowed the freedom to operate in this role by the play of Anita and Colback in the double pivot at the base of the Newcastle midfield. Up until Anita was substituted after sustaining a knock in the 68th minute he had dovetailed perfectly with Colback and the two switched roles seamlessly to ensure that as one of the two pressed the man in possession, the other would hold a central position to control the space in front of the Newcastle defence. Here we can see Southampton building the play from the right hand side and looking to move in to the Newcastle half as Jack Colback moves to engage the man in possession. Anita has taken up a deeper position, although the position itself is a little too linear and leaves angles that Southampton can exploit. The clear space that I have highlighted is covered by the positioning of Wijnaldum, who has shown a willingness to move into the defensive phase where necessary. 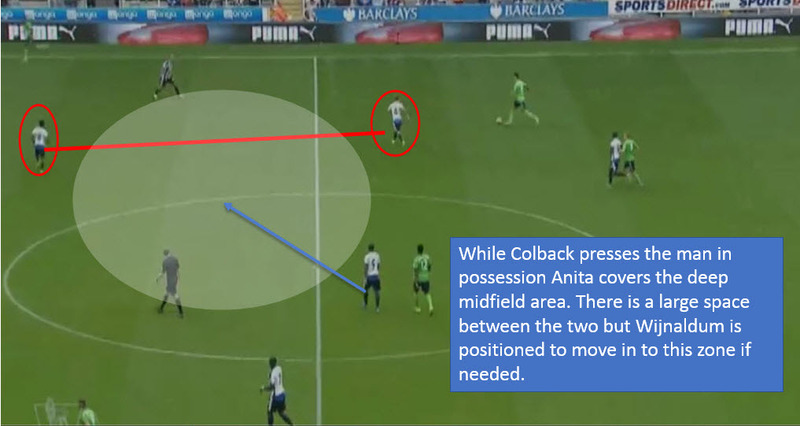 This time the roles from the previous example have been reversed with Anita pressing the man in possession and Colback choosing to sit centrally and control the space in front of the defence. 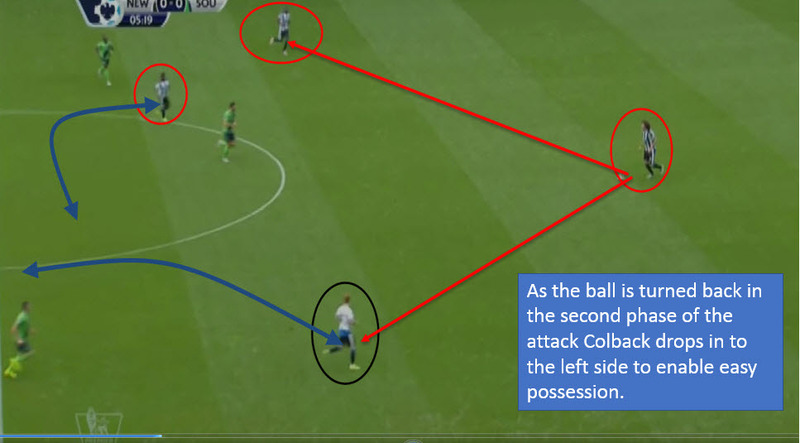 This shows another interesting function of the two deep midfielders as, while in possession in the deep areas, Colback dropped back to take up almost a left centre back position in a back three. 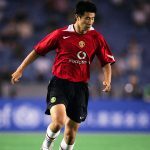 Interestingly, this is something that was highlighted recently on Sky Sports’ Monday Night Football with Jamie Carragher questioning Everton manager Roberto Martinez as to why Gareth Barry had performed the same function for Everton in their match against Watford. This movement allows for the continuation of easy possession, with the left back able to move into a more advanced position and the left winger free to move into the half space to find gaps between the opposition lines of defence and midfield. The final example that I have from the game shows Dutch midfielder Anita dropping centrally between the two centre backs to form a back three. This is a movement that we see regularly across football now, however a single pivot usually performs it. It is interesting to see Steve McLaren using the same movement from a double pivot with Anita acting as the continuity player to keep the ball moving. Again, this is designed to allow the full-backs to advance high up the field and to let the wingers move slightly centrally to the half space to create overloads and passing patterns as Newcastle advance the ball into the opposition half. We really have to stress that this piece of analysis stems from just one game and that it is the start of the season; it is difficult to draw any inference from such a small sample size. That said, the signs are undoubtedly positive for Newcastle United fans this season. Georginio Wijnaldum has the makings of a star in the Premier League with his technique and athleticism appearing ideally suited, and his footballing intelligence showing why he already has 19 caps for the Dutch national team. His willingness to move forwards and backwards to link with the impressive Anita and Colback could be a huge positive for Steve McLaren this season and the interesting functions of the double pivot will allow for a flexible and varied game plan to attack different areas of the pitch at different times. If this continues then Newcastle fans may have more cause to celebrate at the end of this season than they did at the end of the last campaign.